Population share (%) — N.L. Total private dwellings — N.L. Population share (%) — P.E.I. Total private dwellings — P.E.I. Population share (%) — N.S. Total private dwellings — N.S. Population share (%) — N.B. Total private dwellings — N.B. Population share (%) — Que. Total private dwellings — Que. Population share (%) — Ont. Total private dwellings — Ont. Population share (%) — Man. Total private dwellings — Man. Population share (%) — Sask. Total private dwellings — Sask. Population share (%) — Alta. Total private dwellings — Alta. Population share (%) — B.C. Total private dwellings — B.C. Population share (%) — Y.T. Total private dwellings — Y.T. Population share (%) — N.W.T. Total private dwellings — N.W.T. Population share (%) — Nvt. Total private dwellings — Nvt. Today, Statistics Canada provides Canadians with a first glimpse of the latest national statistical portrait with results of the 2016 Census count on population and dwellings. The count tallies 35,151,728 people who reported living in Canada on Census Day, May 10, 2016, and shows the patterns of population growth across the country. About two-thirds of Canada's population growth from 2011 to 2016 was the result of migratory increase (the difference between the number of immigrants and emigrants). Natural increase (the difference between the number of births and deaths) accounted for the remaining one-third. In the coming years, population growth in Canada is projected to be increasingly linked to migratory increase rather than natural increase, mainly because of low fertility and an aging population. 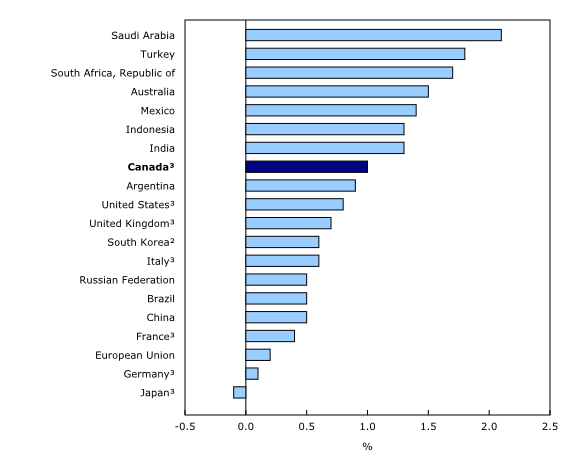 Canada's average annual population growth rate of 1.0% from 2011 to 2016 was the eighth highest among G20 countries, behind Saudi Arabia, Turkey, South Africa, Australia, Mexico, Indonesia and India. The Canadian population, however, is highly concentrated geographically. In 2016, two out of three people (66%) lived within 100 kilometres of the southern Canada–United States border, an area that represents about 4% of Canada's territory. Canada's population has increased tenfold since Confederation. However, the country's population growth has not been constant over those 150 years. This pattern changed at the turn of the 20th century. From 1901 to 1911, the Canadian population grew 3.0% on average each year, a rate that remains the fastest in the country's history. The robust population growth was attributable to both strong natural increase and strong migratory increase. During this decade, more than 1.6 million immigrants came to Canada, with many settling in Manitoba, Saskatchewan, Alberta and British Columbia. After the Second World War, however, immigration levels rose again, and fertility rates increased considerably, leading to the baby boom. As a result, Canada's population growth rate in the 1950s was close to the records set at the beginning of the century. The overall population growth masks considerable differences among the provinces and territories. 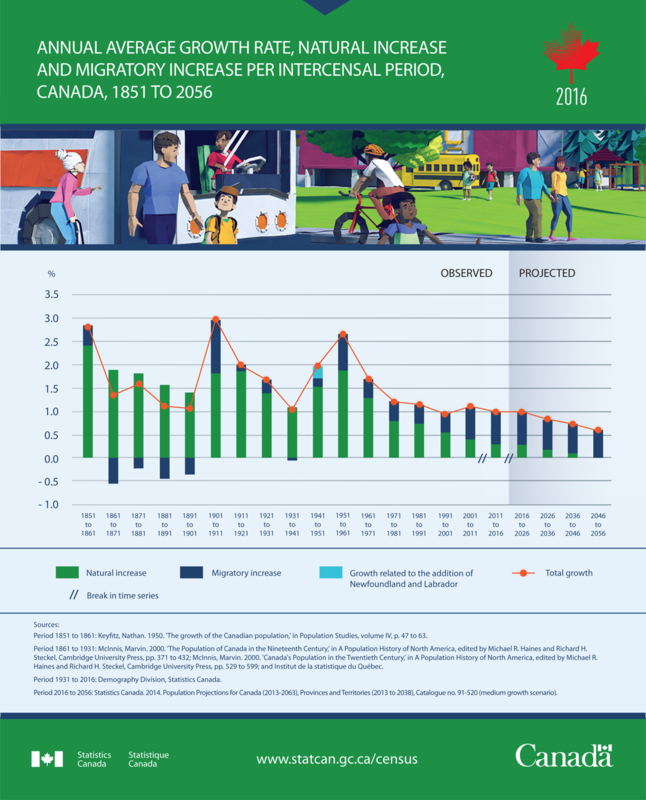 Population growth tended to be higher in Western Canada and lower in Eastern Canada. From 2011 to 2016, the population grew more slowly in the Atlantic provinces than elsewhere in Canada, as was the case during the two previous intercensal periods. Prince Edward Island (+1.9%) recorded the fastest increase in Atlantic Canada, followed by Newfoundland and Labrador (+1.0%) and Nova Scotia (+0.2%). The population declined 0.5% in New Brunswick, the only province or territory to record a decrease from 2011 to 2016. 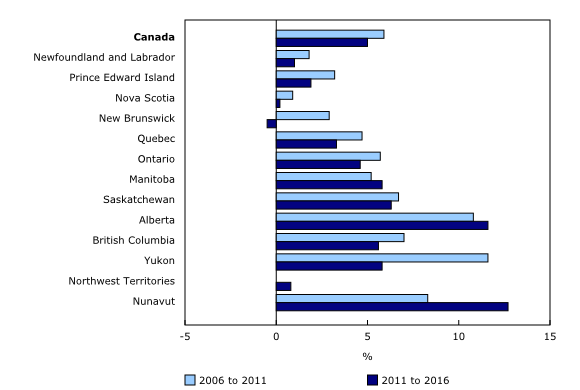 The slower population growth in Atlantic Canada was due to interprovincial migration losses, lower immigration levels and lower natural increases. For example, Newfoundland and Labrador reported more deaths than births in some of the years from 2011 to 2016. As a result of lower population growth, the share of Canadians living in the Atlantic region has decreased in the last five decades. In 2016, 6.6% of Canadians lived in the Atlantic provinces, with Nova Scotia (2.6%) accounting for the largest share, followed by New Brunswick (2.1%), Newfoundland and Labrador (1.5%) and Prince Edward Island (0.4%). In contrast, 10% of Canadians were living in the Atlantic provinces in 1966. In 2016, Ontario and Quebec accounted for 61.5% of the Canadian population. Since 1911 (the first census after Alberta and Saskatchewan joined Confederation), this proportion has ranged from 60% to 64%. Ontario remained, by far, the most populous province in Canada with 13.4 million people calling it home in 2016, representing 38.3% of the Canadian population. This share was down slightly from the 100-year high of 38.5% in 2006. The smaller population share was due to a slowdown in Ontario's growth rate. The number of people in the province rose 4.6% from 2011 to 2016, following a 5.7% gain in the previous five-year period. Ontario's rate of population growth was below the national average for two consecutive intercensal periods, a first since the Second World War. Lower immigration levels and interprovincial migration losses accounted for most of the recent slowdown. In Quebec, the population surpassed the 8-million mark for the first time in census history in 2016. The rate of growth was 3.3% from 2011 to 2016, below the national average of 5.0%. Because Quebec's population growth rate has remained below the national growth rate for the past 40 years, its share of the total Canadian population has fallen from 28.9% in 1966 to 23.2% in 2016. For the first time since joining Confederation, all three Prairie provinces recorded the highest rates of provincial population growth from 2011 to 2016. Population growth accelerated in Alberta and Manitoba―the only two provinces to post higher growth rates from 2011 to 2016 compared with the previous intercensal period. 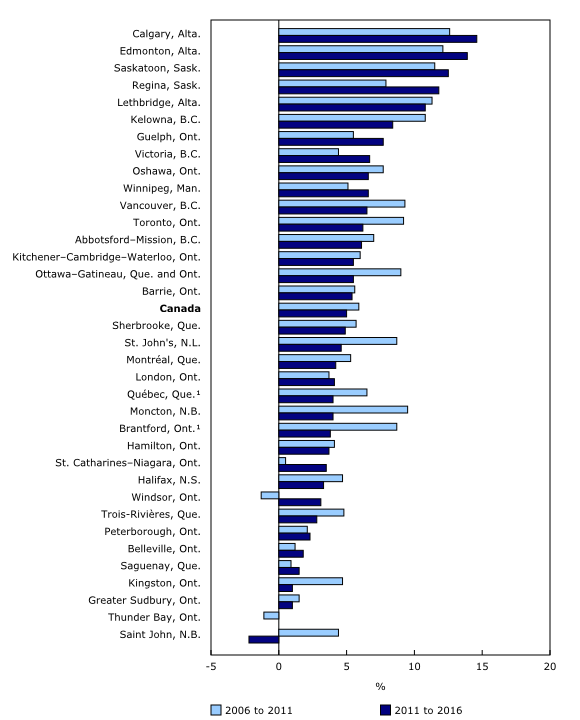 Alberta (+11.6%) had the fastest growth rate among the provinces, up from 10.8% from 2006 to 2011. This was more than double the national average. Alberta also recorded the highest growth among provinces during the two previous intercensal periods. Manitoba's population increased 5.8% from 2011 to 2016, posting a higher growth rate than the national average for the first time in 80 years. Most of the gain was due to stronger international migration. In Saskatchewan, the population rose 6.3% from 2011 and 2016. The province's population growth rate was above the national average for the second consecutive intercensal period. The number of people living in British Columbia also increased more rapidly than the national average, up 5.6% from 2011 to 2016. The four western provinces were the only provinces to record population growth rates higher than the national average. As a result of this growth, almost one-third (31.6%) of Canadians lived in the West in 2016, the largest share on record. British Columbia accounted for the largest proportion (13.2%), followed by Alberta (11.6%), Manitoba (3.6%) and Saskatchewan (3.1%). Combined, the three territories were home to just over 113,600 people in 2016, representing 0.3% of the total Canadian population. This share has changed little since 1911. Nunavut (+12.7%) recorded the highest rate of growth among the provinces and territories. Fertility levels in Nunavut are the highest in Canada, with women giving birth to 2.9 children on average in Nunavut, compared with the national average of 1.6 children. For the first time since Nunavut was founded in 1999, its population surpassed that of Yukon. The population of Yukon grew 5.8% from 2011 to 2016. While this rate was above the national average, it was nonetheless down from the rate of 11.6% recorded from 2006 to 2011. The slower rate was mainly due to interprovincial migration losses. In the Northwest Territories, the population continued to increase slowly, up 0.8% from 2011 to 2016. There are now 35 CMAs in Canada, up from 33 the previous census (see note to readers). The three largest CMAs in 2016—Toronto, Montréal and Vancouver—were home to more than one-third of all Canadians (35.5%), with a combined population of 12.5 million. Toronto (5,928,040 inhabitants) had the largest population, followed by Montréal, which surpassed 4 million inhabitants for the first time in census history (4,098,927), and Vancouver (2,463,431). As a result of strong growth over the last 15 years, Calgary (1,392,609) became the fourth largest CMA in the country in 2016, replacing Ottawa–Gatineau (1,323,783), which fell to fifth place. Edmonton was a close sixth at 1,321,426 inhabitants. From 2011 to 2016, the population grew the fastest in five CMAs located in the Prairie provinces: Calgary (+14.6%), Edmonton (+13.9%), Saskatoon (+12.5%), Regina (+11.8%) and Lethbridge (+10.8%). The three fastest growing CMAs were unchanged from the previous intercensal period. Population growth accelerated in seven CMAs. The increase in the rate of population growth from 2011 to 2016 compared with the previous intercensal period was about two or more percentage points in these seven CMAs: three in Ontario (Windsor, St. Catharines–Niagara and Guelph), two in Alberta (Calgary and Edmonton), one in Saskatchewan (Regina) and one in British Columbia (Victoria). Population growth accelerated the most in Windsor, Ontario, with the number of people living in the CMA rising 3.1% from 2011 to 2016 following a 1.3% decline from 2006 to 2011. The decrease in the previous intercensal period may have been attributable to Windsor's automotive sector, which was particularly affected by the recession in 2008 and 2009. The population grew at a slower pace in many eastern and some central CMAs compared with the previous intercensal period. The number of people living in Moncton, New Brunswick, rose 4.0% from 2011 to 2016, following a 9.5% gain from 2006 to 2011, while the population in St. John's, Newfoundland and Labrador, was up 4.6%, following an 8.7% increase in the previous intercensal period. The population also grew less quickly in Kingston, Ontario, up 1.0% from 2011 to 2016, after a 4.7% increase in the previous intercensal period. Ottawa–Gatineau recorded slower growth as well, with its population rising 5.5% from 2011 to 2016, following a 9.0% gain from 2006 to 2011. From 2011 to 2016, the number of people living in the country's three largest CMAs also grew at a slower pace. In Toronto, the population grew 6.2% following a 9.2% gain from 2006 to 2011, while in Montréal, the population rose 4.2% following a 5.3% increase. In Vancouver, the number of people was up 6.5% from 2011 to 2016, after growing 9.3% during the previous intercensal period. The population was unchanged or declined in only two CMAs from 2011 to 2016: Thunder Bay, Ontario, and Saint John, New Brunswick. Low population growth in the CMA of Thunder Bay may be partly attributable to fluctuations in the mining and forestry industries, which often affect the area's overall economy. In Saint John, the population declined 2.2% from 2011 to 2016, following a 4.4% increase from 2006 to 2011. Most of the decrease was attributable to interprovincial migration losses. For more information on population growth in the CMAs by census tract, see the 2016 Census thematic maps. From 2011 to 2016, 7 of the 10 census agglomerations (CAs) with the highest population growth rates were located on the Prairies: four in Alberta, two in Manitoba and one on the Saskatchewan–Alberta border. The population grew the fastest in Sylvan Lake, Alberta, up 19.6% from 2011 to 2016. The other three fastest growing CAs were Wasaga Beach and Collingwood, in Ontario, and Squamish, British Columbia. Some CAs recorded a population decline from 2006 to 2011, but posted population growth from 2011 to 2016. This occurred in Thompson, Manitoba, where the number of people rose 6.6% from 2011 to 2016, following a 4.6% drop from 2006 to 2011; Kawartha Lakes, Ontario, where the population grew 3.0%, after decreasing 1.8%; and Port Hope, Ontario, where the number of people was up 3.3%, following a 1.1% decline. From 2011 to 2016, 9 of the 10 fastest decreasing CAs were located in the Atlantic provinces or Central Canada: four in Ontario, two in Nova Scotia, one in New Brunswick, one in Quebec and one on the border of New Brunswick and Quebec. The 10thCA is Prince Rupert, British Columbia, where the population fell by 2.8%, the seventh fastest rate of decline. The number of people in Campbellton, which straddles the New Brunswick–Quebec border, fell 9.3%, the largest population decrease among CAs. In Nova Scotia, the population decreased in every CA. New Glasgow (-3.7%) posted the strongest percentage decrease, followed by Cape Breton (-2.9%), Kentville (-0.5%) and Truro (-0.3%). Some municipalities went from an increase or a stable population size from 2006 to 2011 to a decrease from 2011 to 2016. In four CAs, the rate changed by at least five percentage points: Campbellton, New Brunswick–Quebec; Quesnel, British Columbia; Pembroke, Ontario; and Rivière-du-Loup, Quebec. For more information on the 2016 Census results for municipalities, see "Municipalities in Canada with the largest and fastest-growing populations between 2011 and 2016" and "Municipalities in Canada with population decreases between 2011 and 2016". Additional information is available the Focus on Geography Series, the Census Profile and Highlight tables. In Canada, the number of private dwellings occupied by usual residents increased 5.6% from 2011 to 14,072,079 in 2016, following a 7.1% increase in the previous intercensal period. Nunavut (+13.4%) recorded the fastest growth in dwellings, in line with its population growth, which was also the highest in Canada. Alberta (+9.9%) posted the second largest percentage increase, followed by Yukon (+7.8%) and British Columbia (+6.6%). Manitoba and Nunavut were the only jurisdictions to post higher growth in private occupied dwellings compared with the previous five-year period. The number of dwellings rose more slowly than the national rate in the Atlantic provinces, Quebec, Manitoba, and the Northwest Territories. In Ontario (+5.8%) and Saskatchewan (+5.6%), the number of dwellings increased at a pace similar to the national rate. The gain in Ontario (+281,666), the largest in absolute numbers in Canada, was more than twice the size of increases in Alberta (+137,403) and Quebec (+136,320). Today, Statistics Canada is releasing the first results from the 2016 Census of Population. These results focus on the growth in population and dwellings from 2011 to 2016 at the national, provincial and territorial levels, as well as for metropolitan areas (census metropolitan ares [CMAs] and census agglomerations [CAs]). Census results show to what extent the Canadian population is changing, mainly as a result of immigration. These changes vary greatly depending on the region and have many implications for Canadian society, notably for its economy, ethnocultural and linguistic composition, and social fabric. Several 2016 Census products are also available today on the 2016 Census Program web module. This web module has been designed to provide easy access to census data, free of charge. Information is organized into broad categories, including analytical products, data products, reference materials, geography and a video centre. Data products include the population and dwelling counts for a wide range of standard geographic areas, available through the Census Profile and Highlight tables. Reference materials contain information to help understand census data. They include the Guide to the Census of Population, 2016, which summarizes key aspects of the census, as well as response rates and other data-quality information. They also include the Census Dictionary, which defines census concepts and variables. Geography-related 2016 Census Program products and services can be found under Geography. This includes GeoSearch, an interactive mapping tool, and thematic maps, which show data for various standard geographic areas. A brief historical picture of the population of Canada and its largest metropolitan areas can be found in the Video centre. An infographic entitled Population Growth in Canada, 2016 Census of Population also illustrates some key findings, including population growth from 2011 to 2016 for Canada, provinces and territories and the six largest CMAs in the country. Users are also invited to chat with an expert on February 10, 2017, from 12:30 p.m. to 1:30 p.m., Eastern standard time. Census counts are different from population estimates. For more information, please refer to the Guide to the Census of Population, 2016. The rate of population growth reported in this document is calculated as the difference in population size between two censuses, divided by the population of the earlier census, expressed as a percentage change. All data and results presented in this document are based on the 2016 geographic boundaries. According to the geographic boundaries of the 2016 Census, Canada now has 35 CMAs and 117 CAs. Readers can consult the CMA and CA reference maps. The two new CMAs are Lethbridge, Alberta, and Belleville, Ontario. In addition, the CMA of Montréal was expanded to include the former CA of Saint-Jean-sur-Richelieu. Three CAs from the 2011 Census ceased to be CAs in the 2016 Census: Saint-Jean-sur-Richelieu, Quebec; Amos, Quebec; and Temiskaming Shores, Ontario. Eight new CAs have been added since the 2011 Census: Gander, Newfoundland and Labrador; Sainte-Marie, Quebec; Arnprior, Ontario; Carleton Place, Ontario; Wasaga Beach, Ontario; Winkler, Manitoba; Weyburn, Saskatchewan; and Nelson, British Columbia. For detailed definitions of CMAs and CAs, please refer to the Census Dictionary.